Jointace Review – Is This Product Safe To Use? Jointace is one of a growing number of supplements on the market designed to combat joint pain. Chronic joint discomfort can be caused by several factors and has become increasingly prevalent due to a growing population of seniors that are suffering from aging joints but want to remain active. What are the Ingredients Used in Jointace? What are the Pros of Jointace? What are the Cons of Jointace? It is produced by Vitabiotics, a British company, and can be purchased from the manufacturer directly or from independent retailers. The standard Jointace formula comes in capsules and costs approximately $17.00 for a one-month supply. The website includes customer testimonials, company information, and an FAQ section, but does not mention a money back guarantee. It comes in several different formulations and formats. Consumers may choose from a targeted patch, a gel, or capsules. 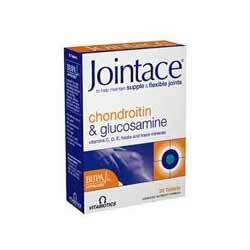 The original Jointace supplement is the capsule form, which contains Glucosamine and Chondroitin, two popular joint pain ingredients that work in tandem with each other. These synergistic compounds are purported to rebuild damaged joint cartilage, strengthen connective tissue, and aid in lubrication. In this way, they reduce the friction that causes joint inflammation, pain, and stiffness. It is taken at a dose of two capsules a day and should be used on a regular basis for maximum effect. Results should be experienced within one to two months of use. It has no known side effects but is not suitable for shellfish allergy sufferers. It appears to be a reputable product that gives consumers a choice of formulas and methods of administration. However, the manufacturer does not present clinical proof of successful results or scientific data to back up their claims of product effectiveness. In addition, there is a substantial window of time for the positive effects to be felt, and the consumer may have to use an additional product such as the patch or gel to gain instant relief while they wait for the cumulative effects of the capsule to build.